When looking for new curly hair products to help tame your tresses, look at the list of ingredients rather than the brand or product line itself. Most of the time, if you are at a salon and looking through professional products for curly hair, all of your options are great. Whenever you are in a drugstore, however, it is best to spend some time reading the labels to find the best product that will suit you and your curly hair perfectly. Overall, no matter where you shop, the variety of silicones in hair products should have you and your ringlets running for the hills. If you want to avoid dry, brittle and flat strands, choose silicone-free hair products without any of the ingredients listed below. Knowing what you're putting in your hair is half the battle to perfect curls. Silicones in curly hair products will produce build up in your hair and scalp due to their inability to dissolve in water. Since their names can be quite difficult to remember, just keep in mind that anything ending in “cone,” “conol,” “col,” or “xane,” should be avoided. The only exceptions here are those ingredients with the abbreviations "PEG" or "PPG" in front of them. This abbreviation will alert you that they were made to be water-soluble, and won't produce the build-up other silicones are known to cause. Wondering what the big deal is about silicones? Well, check it out and let CurlChemist give you all the details! These ingredients are silicones as well, but the way that they are chemically constructed allows them to help repel the deposits that the typical silicones leave behind. Yes, they will slow down the build-up process, but as time passes, you will want to switch from products containing these ingredients to something more beneficial for your hair and scalp. These silicones may boast that they prevent build-up. Fortunately, you can use a clarifying shampoo and deep conditioner to restore your hair's health and vitality. These ingredients are still considered to be silicones, but are somewhat soluble in water. If you are in a hurry, and must purchase curly hair products that contain them, beware that they will cause unwanted build-up over time just like any other silicone. In order to get rid of the build-up that these products bring, it is best to use a surfactant. A surfactant is a harsh chemical that will clean your hair and rid it of all the unwanted chemicals and build-up. Surfactants are found in all soaps and cleansers, however, for curly hair, it is best to use a nonionic surfactant. Nonionic surfactants are gentler on the hair and won’t cause any damage to the curl pattern. Take this comprehensive list of ingredients in curly hair products with you the next time you go shopping for your hair. 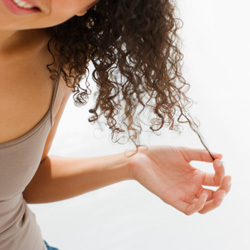 Overall, be careful when choosing your curly hair products, and remember, no one knows your curls like you do. What works for one person may not work for you, but these ten product ingredients cause the same amount of damage to all hair types. Pick up a bottle and investigate next time you’re out buying your hair products; you’ll be amazed to find what your favorites contain, and what they don’t. Be a smart curly shopper!